The Uncut International Version on Amazon.com! Comparison between the Asian Version and the International Version. 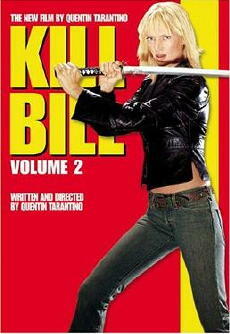 The Asian Version is represented through the HK-DVD from Universe while the International version is represented through the US-DVD from Buena Vista. Why this Asian Version exists at all is anyones guess. no more than one scene has been re-cut slightly and unimportant enough to be ignored altogether if one already owns the movie on DVD. It seems like Tarantino has trimmed the long Esteban sequence a bit for the American audience to make it somewhat more fast paced. Another explanation fails me. The Asian Version is 46 sec. longer than the International Version! 81:47 Min. - 82:44 Min. Beatrix driving to Esteban is cut differently in both versions. Duration: 57 Sec. - AV 38 Sec. longer. 82:50 Min. - 82:57 Min. Additional shot of a woman with a laundry basket (not contained in the US) looking at Beatrix. Then another shot of Beatrix. 82:59 Min. - 83:03 Min. The second shot of the woman with the basket is complete in the AV and missing about half of it in the US. The next shot of Beatrix is shorter as well. The shot of Esteban is shorter in the AV (4 Sec.). Beatrix' line from the off has been put over the previous shot a bit. In exchange, the shot of Beatrix getting out of the car is longer in the AV (3 Sec.). Shot Beatrix a bit longer. 83:32 Min. - 83:34 Min. In the AV the shot of Beatrix walking across the room is shorter at the beginning but longer at the end.